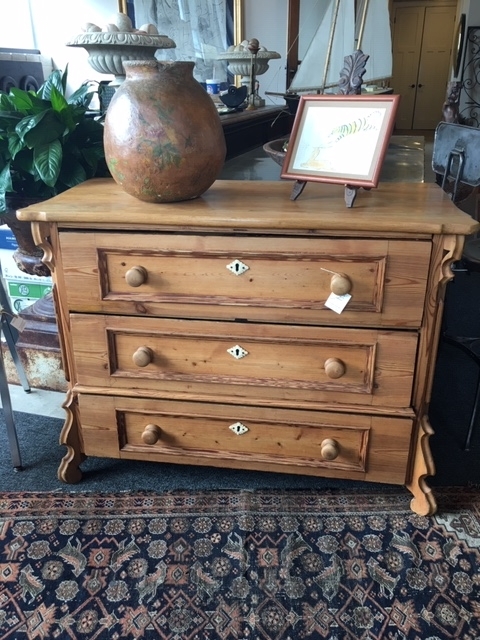 This charming 3 drawer pine chest has wooden knobs and decorative carved detailing. The three large drawers have an inset frame on the drawer front with an attractive key hole detail. 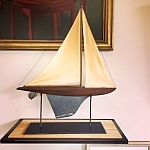 This attractive hand made sailboat is a unique folk art piece. The hull is made of hard styrofoam and painted black. The keel is made of wood, as are the masts. 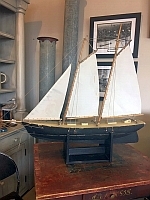 The sailboat sits on a black painted wooden stand. Height on stand: 38.5 in. This primitive handcrafted sailboat has a wooden hull and the keel and rudder are metal. 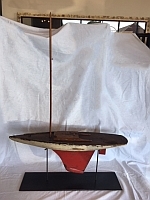 Base is 17" X 6"
This hand crafted vintage pond yacht sits on a contemporary iron stand. The hull of the boat is made of wood and the keel and rudder are metal. 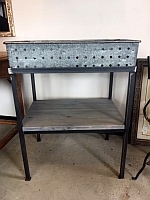 This interesting table is made with a vintage industrial metal bin. The contemporary metal table frame was made to hold the bin. The wood shelf is painted a light gray. The bin can be removed from the frame. 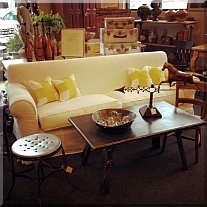 This would be great for extra storage or or it would make a perfect bar. 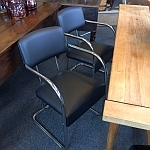 This set of vintage 1950's chairs is in very good condition. 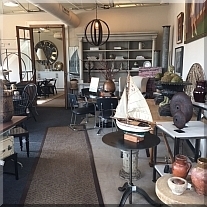 They have been recovered with black leather and black nailheads were used on the chair backs. 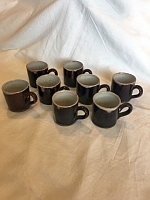 Cul noir "black bottom" refers to the dark glaze found on the bottom of this pottery. 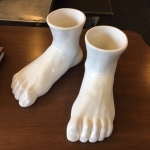 The pottery is a heavy stoneware. Hand carved from a single piece of wood. 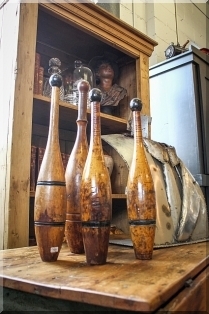 Made in India in the early 20th century. This is a very early example of French glazed pottery. 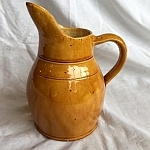 The mustard yellow glaze of this jug is very vibrant with variations in the shades of color. 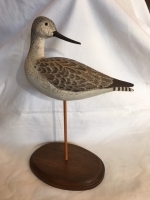 This charming wooden decoy has been hand carved and painted. The fins are metal. 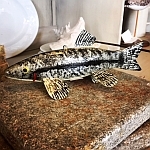 The decoy has been signed and dated by well known, Michigan carver, Lee Baldwin. 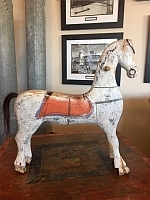 This charming, primitive horse was originally made as a ride on toy for a child. Base 7 x 5 in. 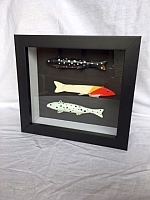 Guy Sewell was a blue ribbon carver and artist from Michigan. 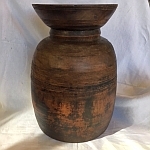 The bottom of the stained wood base is signed and dated (1993) by the artist. Height: Adjustable 19.5 in. - 26.5 in. 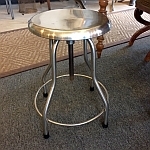 This industrial metal stool was once used in a hospital or a doctor's office. There is a tag below the seat that says...Made by Shampaine Company, St. Louis, U.S.A.